의령 보리사지 금동여래입상(宜寧 菩提寺址 金銅如來立像)는 1948년 5월 경상남도 의령군 가례면 갑을리 도굴산에 있는 보리사에서 출토된 것으로 1981년부터 동아대학교에서 보관하고 있다. 머리 위에 있는 상투 모양의 머리(육계)는 마치 밥그릇을 엎어 놓은 것 같으며, 원만한 얼굴에 비해 입은 매우 작게 표현되었다. 양 어깨를 감싸고 있는 옷은 가슴부분에서 리본 모양의 매듭을 지었고 배에서 밑으로 반원형의 무늬가 가늘게 그어져 있다. 오른손은 옆에서 허리까지 내리고 왼손은 수평으로 들었는데 모두 손바닥을 위로 하고 있다. 8각 대좌(臺座)는 앞면과 뒷면을 완전히 뚫어서 모양을 냈다. 전체적으로 완전한 상태를 유지하고 있고 조각 수법으로 보아 통일신라시대 후기에 만들어진 것으로 보인다. 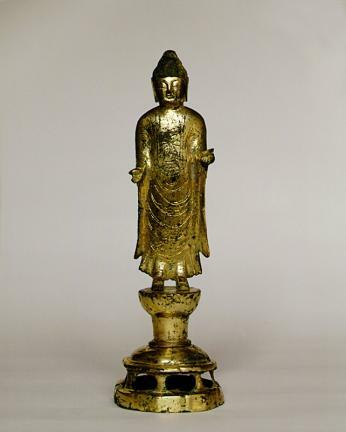 This gilt-bronze standing Buddha was excavated from Borisa Temple at Dogulsan Mountain (in Gabeul-ri, Garye-myeon, Uiryeong-gun, Gyeongsangnam-do) in May 1948, and has been kept by Dong-A University since 1981. The Buddha’s hair is expressed as a small usnisa (a protuberance symbolizing supreme wisdom, resembling an over-turned bowl) on the top of his head. He has a round face and a relatively small mouth. The Buddha’s robe covers both shoulders and is knotted with a bow at the chest, and features semicircular patterns expressed in thin lines below the stomach. His right hand hangs down, while the left arm is held upward, and both palms are facing outwards. The statue’s octagonal pedestal exhibits a design made by cutting a full hole from the front to the rear side. This standing Buddha, preserved more or less in its original form, is assumed to have been made toward the end of the Unified Silla period in view of its skilled carving.